Bangladesh Air Force BAF Job 2019. 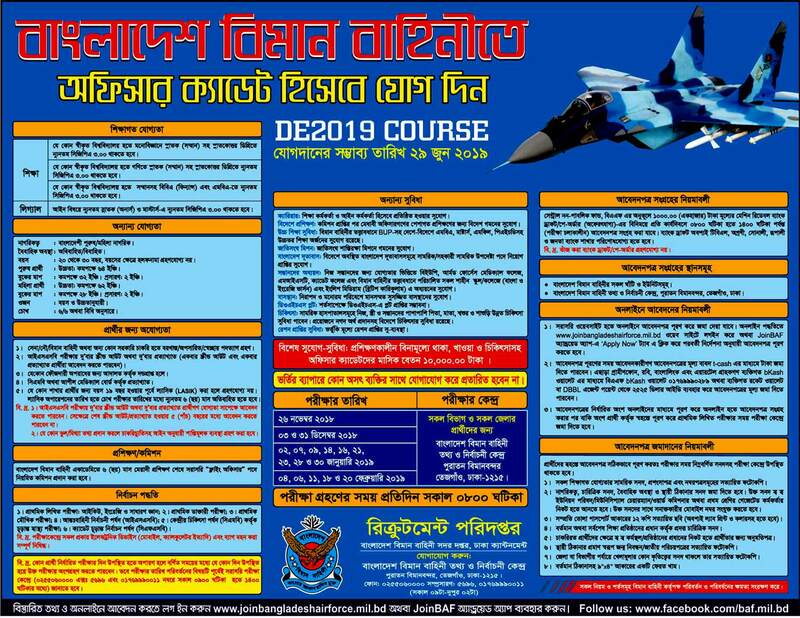 Bangladesh Air Force will recruit for the VARIOUS post for the year 2019. Online Application submission is going on. Interested, eligible & enthusiast Bangladeshi Citizenship candidates are requested to Apply Online. The Deadline for Online Application Submission is Please See the image Job circular for details. Bangladesh Air Force (BAF) was established on 28 September 1971 during the war of Liberation with only three aircraft. During last 43 years, Now Bangladesh Air Force (BAF) has been established as one of the innovative and skilled air force of the world. Name of the Post: Please See the attached image Job circular for details. Job Circular Published Date: Please See the image Job circular for details. Application Starting Date: Please See the image Job circular for details. Application Ending Date: Please See the image Job circular for details. Number of the Vacancy: See the attached circular for details. Educational Qualifications: See the circular for details. Age Limit: See the circular for details. Employment Type:Please See the image Job circular for details. Experience: See the circular for details. Salary Scale: See the circular for details.